This week, Stephen Ibaraki has an exclusive interview with Dr Chaesub Lee. 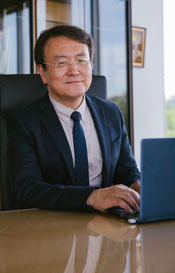 Dr Chaesub Lee is the Director of ITU’s Telecommunication Standardization Bureau, following his election at the 2014 Plenipotentiary Conference in Busan, Republic of Korea. He took office on 1 January 2015. Dr Lee has been involved in the telecommunication and ICT standardization field for 27 years, specializing in areas such as integrated services digital networks (ISDN), global information infrastructure (GII), Internet protocol, next-generation networks (NGN), Internet protocol television (IPTV) and cloud computing. He started his professional life in 1986 as a researcher at Korea Telecom. After 17 years he took up a role at the country's Electronic and Telecommunications Research Institute (ETRI), where he stayed for the next eight years. Most recently he worked at the Korea Advanced Institute of Science and Technology (KAIST), and as a senior advisor to the Korean Ministry of Science, ICT and Future Planning (MSIP). Within ITU Dr Lee served as Chairman of the ITU Next-Generation Networks (NGN) Focus Group to address the growing need for global standards for NGN, including service requirements, functional architecture and mobility, security and Quality of Service (QoS). He was also Vice-Chairman of the ITU IPTV Focus Group which works to coordinate and promote the development of IPTV standards. He acted as Vice-Chairman of ITU-T Study Group 13 'Future Networks and Cloud' from 2001 until 2008, becoming Chairman of that group in 2009. Study Group 13 works to develop standardization solutions for NGNs, future networks and cloud computing, Internet of Things (IoT), and mobile telecommunications, to ensure their smooth international deployment in the coming years. Dr Lee holds a PhD in Multimedia Engineering. He is married with two children. :00:20: Dr Lee, can you describe your journey from a very early age to your current role and some of the milestones and valuable lessons that continue to shape your vision, goals, execution style? "....I'm South Korean, born after the Korean War. I started my professional life in 1986 as a research engineer in Korea Telecom during the initial phase of Korean ICT development (modernizing of Korean Telephone networks). I had an opportunity to attend an international meeting called CCITT (currently ITU-T). It gave me a great experience to look at the global world....My experiences, coming from one of the least developed countries to this country (an ICT diverse country), helped to shape my vision and goals in terms of UN systems where ITU belongs. It was also a good way to find how we can work in collaboration to execute the UN system based on my experiences in so many different domains...."
:03:18: After you finish your role with the ITU do you have any other plans? "....It's a little bit early because I was just elected at the end of 2014....I would like to continue with my professional life based on the international platform...."
:04:05: Can you overview the structure of ITU, its history and its value? "....ITU is a United Nations specialized agency for dealing with information and communications technologies. We are given our life by the membership of 193 member states (exactly the same way as the UN system), and over 800 private sectors including operators, industries, academia and even research institutes. ITU was established in 1865 to meet the needs of the international standards for telegraph systems....ITU is a multi-stakeholder model with clear geographical representations. We are membership driven work over ITUs so we have three different sectors called the bureaus, according to the mandate. The first one, ITU-R, is the radio communication sector which is responsible for the global coordination of radio frequency communications....Second, my bureau, is the ITU-standarization sector which works for developing international standards. The last bureau we call cap ITU-D, the developmental sector that complements the technical works with the capacity building in the application of ICT into developing countries...."
:07:00: Can you briefly talk about some of the areas that the ITU in general is concerned about? "....Practically, the telecommunication boundary, between telecommunications and ICT (the information communications technologies), is very difficult to differentiate clearly – it's already converged together. My bureau is working hard to extend how we can harmonize between telecommunication infrastructure to support these information societies, using the information technologies or communications technologies...."
:08:48: What would be the value proposition for business executives (CEOs, CIOs, and CTOs) of the work of the Telecommunication Standardization Bureau? "....All these subjects give our stakeholders (especially industry leaderships) one integrated platform to disseminate with their businesses and find their partners and any customers who are in need of this technical support. That's the reason why I said ITU has real multi-stakeholder models...."
:11:29: As I've become more familiar with the ITU and the Standardization Bureau, it seems to me that ITU is also interested in things like the future of the workforce or accessibility or even things like new technologies around public ledger and blockchain and how that impacts telecommunications and financial services. Am I right that it's just so far-reaching, even in those areas? :13:51: How does the ITU and your work tie into supporting the Sustainable Development Goals (SDG)? "....This is our study result, for the whole of ITU (not only for ITU-T). The whole ITU (including our Secretary General) now study how to support the SDGs and also how to get some added requirements from those 17 goals to direct our activities, our projects. So this is now our status; these SDG's 17 goals are an essential part of our future direction...."
:18:59: You have several major conferences coming up. Can you describe the expected outcomes of the conferences and the impact it will have? "....This year is a very important year for my bureau because we have the so-called Assembly, the World Telecommunication Standardization Assembly (WTSA). Once in every four years all stakeholders get together to discuss the past years of our development and identify future directions, establish new strategies as well as looking at our structure....The day before WTSA 16, is one of our important e-events called Global Standards Symposium. This is the get-together of all standards organizations with experts in standards development to discuss how standards efforts could best integrate the considerations. The result of this Global Standards Symposium is input to WTSA for their considerations....During the WTSA system we plan side events. The first one is this year. 2016 is the sixtieth anniversary of our ITU-T establishment so we plan to have sixtieth anniversary talks with high profile speakers to explore the latest developments, specifically in artificial intelligence and digital financial services. We have another side event called the Invitation-only CxO meeting. The CxO meeting invites industry leaders (CEO, CTO, CSO, CIO) and we try to explore the new industry enviromix to address how ICT standards or how ITU platforms support these industry requirements. Finally we have planned the first meeting of the ITU Women in Standardization Expert Group (WISE). One of our roles is increasing the leadership from women to participate in the ICT sector or ICT standardization activities...."
:27:10: Also there are some annual events can you talk more about them, for example, Telecom World or Kaleidoscope? "....We have an event with ITU Telecom World. This year it is planned in Bangkok, Thailand from 14 to the 17 November. This is an annual event to get all the industries together and also the administrators and regulators. This is a chance to show all the developments and also address all the developing resources....We already have more than ten years of effort and again this year we have Kaleidoscope. This academic event is planned at Bangkok, in the course of this ITU Telecom World. This year we are piggybacking with ITU Telecom World to address our subject. This Kaleidoscope is how to support Sustainable Development Goals and also planned is to have special sessions dealing with artificial intelligence...."
:30:15: You are on the Financial Services Roundtable Technology Advisory Council and contributing to their summit which is called the FinTech Ideas Festival, an invitation-only CEO-focused summit. What will you be contributing to the summit and what do you hope to learn? "....We understand financial services is one of the critical essential platforms building trust. So my bureau also has a study on how to build trust relationships in an information society. We have a certain study reserved but it's at a very beginning stage. It would be good to use this roundtable to address the issue of trustworthy relationships in an information society...."
:33:10: What is your relationship with the XPRIZE foundation and their work with Artificial Intelligence (AI) and what do you hope to achieve? "....From our point of view as a specialized agency of the United Nations, we strive to promote innovation with a potential to lead to a better quality of life for all the world's people. IBM Watson AI-XPRIZE plans to celebrate the development of scalable AI solutions to address humanity's grandest challenges. I think this really aligns very well with the priorities of ITU; so many of these grand challenges are best described by the United Nations STGs....We believe the ITU contribution to the facilitation of this XPRIZE will give us some good opportunities to grow this global network. This offer of our assistance will also extend to the provision of our eco-system of technical tools and resources...."
:36:26: You have touched on this already but I wonder if you wanted to expand on what you’ve discussed so far and how you perceive the future of AI and ITU’s role? "....The information society is moving forward for a knowledge-based society, the future of AI has an essential contribution in how to build up this knowledge based society. So if our understanding is right, then we believe ITU's engagement to bring this AI community to meet the ICT technical experts will be a good opportunity to advance in the ICT environment, including our ICT standards...."
:40:08: Dr Lee comments on his work with international financial services area and his goals. :42:57: What are your views on the main areas for consideration with blockchain? "....We are very interested in blockchain because blockchain has the potential to reduce cyber risks by offering identity authentication so there's no reason for requirements for numbering, maintaining and indexing and communicating information....We are trying to identify how this blockchain is helpful for our ITU-based standards to support these financial services. The other direction is how standard ITU technologies we developed are facilitated, are valuable in blockchain operations. So we are looking at this and believe both of these directions will be really helpful to build trust based trading and trust based societies...."
:45:24: Let's extend the last question to other areas such as big data, analytics and IoT? What are your views for consideration there? "....Big data analytics, IoT, 5G and Smart city....we think these are technical terms but aiming for the same goals to make the smart community....ITU is trying to invite relevant experts on how to harmonize those subjects to make as a standard so it would be useful for everybody to use the same language and a tool to use with the same language...."
:48:13: Dr Lee comments further about 5G and what would supercede 5G. "....Let me start with the language part of 5G. We may easily think of 5G after 4G, so 3G, 4G, 5G and easily think about after 5G should be 6G or 7G, which means mainly from the extension or continuation of mobile. That was very challenging for us if you look at 5G requirements which developed from many organizations, even many industries...."
:54:34: Can you comment on the future of the workforce? "....Around 78 percent of business leaders are expecting to have digital limitations within three years. Digital is desirable, bringing with it cost efficiencies, innovation, more productivity and high quality work. This can be achieved using technologies, specifically when they say all these digital limitations should be in need of support, big data processing and more intelligent processing, maybe coming from artificial intelligence....We believe all this could be an essential part of the future of the workforce...."
:56:31: Describe some major projects you are working on, the problems and solutions? "....Our major project is now aiming for year 2020. We have the World Telecommunication Standardization Assembly once every four years this year which means the goal of this year's WTSA-16 is addressed for year 2020 because the next WTSA should be in year 2020....With that dateline we have 3 key projects. The first one is mainly on how to support, how to build this IMT2020 into 5G. So we have already started this study from the beginning of last year....IoT 2020 is another important subject for us. IoT is collaborating with relevant SGOs to support the smart city operation. In this regard we are really keen to define interoperability between different IoT devices and between different IoT standards....The third project is we try to contribute our information society should be trustworthy. We will continue this as a little bit of a long term project, but we are aiming for year 2020 so we call this Trust 2020...."
:01:00:05: What are some major challenges faced by business? Looking out at the business community what do you see as some areas that they have to address? "....We are very delighted to develop our technical innovations but we have to assume responsibility to protect humanity and ensure human jobs. Some jobs might disappear in the future but we have to find out ways to replace some of those jobs to continue our human life in its good way. So obviously it's a really big challenge for the future business domains...."
:01:08:17: You have many interests. Can you talk further about them? "....One of the benefits of this international activity is the ability to visit many different cultural environments. In our ITU system we classified 5 different regions: America region, Asia Pacific and Russian region, Africa region, European regions and Arab region. Each region has its own different culture and knowing these cultures is a very interesting experience, and knowing the people is the very interesting part....I want to say international activities (in this sense) are a great opportunity to know the people, the cultural differences and the countries...."
:01:11:44: From your extensive speaking, travels, and work, can you share any stories (perhaps amusing, surprising, unexpected or amazing)? "....I just visited Mexico and it was a good opportunity to visit the pyramids. I recognized the difference in the pyramids in Mexico and the pyramids in Egypt. The one in Egypt has a very sharp surface but the Mexico pyramid looks stepped. What I found, is the bottom of the two pyramids (which were built more than 2000 years ago), are the same size. So that was a subject for historical scientists to identify all this and we discussed at that time whether they communicated with emotional communication teleporting or teleworking or things like that. So that was one of the discussions that I had during my visit of Mexico...."
:01:16:01: Chaesub, with your demanding schedule, we are indeed fortunate to have you come in to do this interview. Thank you for sharing your deep experiences with our audience.